The DNA binding protein and chromatin structural regulator DEK regulate many cellular processes. These include proliferation, differentiation, apoptosis, senescence, DNA repairing and the maintenance of stem cell phenotype. DEK is increasingly recognized as a crucial player in many steps of cancer initiation and progression, and is precisely regulated by abundant promoting and inhibiting factors directly or indirectly. DEK may serve as an architectural modulating protein to regulate the expression and function of multiple human genes in cancer cells. In this article we have reviewed the specificities and complexities of DEK in the regulation of transcription factors and global chromatin, including its biologic roles in malignant cells, and summarized the current research. The possible use of DEK as a diagnostic marker and drug target in the prevention or treatment of tumors is also discussed. Keywords: DEK, cancer, gene regulations, biologic roles, diagnostic marker, drug target. 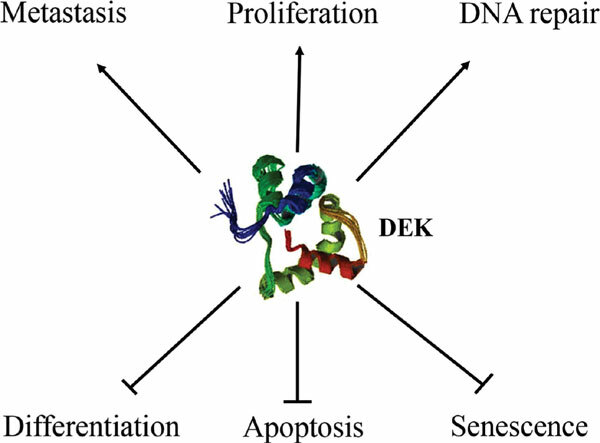 Keywords:DEK, cancer, gene regulations, biologic roles, diagnostic marker, drug target. Abstract:The DNA binding protein and chromatin structural regulator DEK regulate many cellular processes. These include proliferation, differentiation, apoptosis, senescence, DNA repairing and the maintenance of stem cell phenotype. DEK is increasingly recognized as a crucial player in many steps of cancer initiation and progression, and is precisely regulated by abundant promoting and inhibiting factors directly or indirectly. DEK may serve as an architectural modulating protein to regulate the expression and function of multiple human genes in cancer cells. In this article we have reviewed the specificities and complexities of DEK in the regulation of transcription factors and global chromatin, including its biologic roles in malignant cells, and summarized the current research. The possible use of DEK as a diagnostic marker and drug target in the prevention or treatment of tumors is also discussed.